Avian Chlamydiosis also know as ornithosis is a common disease of many bird species and is caused by the bacterial organism Chlamydia psittaci. Bird’s owners should be aware that this is a zoonotic disease, meaning it can be transmitted from birds to humans, and also know its implications. The disease in people is called Psittacosis, or Parrot Fever. 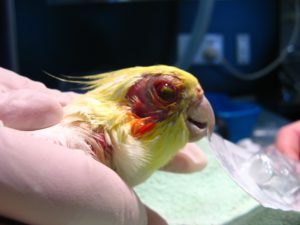 Transmission of the disease is primarily through inhaling respiratory secretions or contaminated dust from droppings or feathers of infected birds. Risk of infection is increased by close contact with infected birds that are shedding the organism, therefore, the disease is more common in stressed birds (shipping, overcrowding, or malnutrition) since birds tend to shed the organism when stressed. Infected birds do not have to show specific signs of the illness in order to transmit the disease. The visible signs of chlamydiosis are typically respiratory or gastrointestinal in nature. Lime-green diarrhoea or urates, is a common sign in many species. Although the disease is systemic, the signs primarily relate to the eyes, respiratory tract, and liver. Some birds may show general signs of illness: Lack of appetite, weight loss, depression, diarrhoea, discharge from the eyes or nares, or even death. However, birds may exhibit few visible signs of illness and these same signs can be associated with a number of other diseases. Some birds that are actively infected with Chlamydia psittaci may show no signs of illness. An infected bird may carry the organism to their young. Baby birds are more susceptible to severe infection than adult birds and may die in the nest or soon after weaning. A confirmed diagnosis of chlamydiosis in a live bird is sometimes difficult and depends on the species, length of time since exposure, and general condition of the bird. Your avian veterinarian will conduct appropriate tests and evaluate the results in conjunction with a thorough examination. Current recommendations are that a suspect bird be given more than one type of test, along with evaluation of the bird’s condition and history, to achieve a diagnosis. Some veterinarians recommend treatment of all suspected cases with or without a positive test result. It is very important to complete the full course of treatment prescribed by your veterinarian. If chlamydiosis has been diagnosed, or if treatment has been recommended by your veterinarian, all exposed birds in the household should be treated at the same time to reduce the spread or recurrence of the disease. It is imperative that infected birds be isolated during treatment and that certain sanitary measures be employed to prevent spread or reinfection of the disease. The success of treatment depends on all of the medications being given in the recommended dosage and time. Antibiotic dosage and feeding should be directed by your veterinarian to ensure adequate levels are being consumed. Specific means of treatment should be determined by your avian veterinarian. Depending on the condition of the patient, other supportive treatment may be recommended as well. Your veterinarian will discuss the most appropriate treatment for your bird. Treatment must be continued for a minimum of 45 days. The bacterial organism Chlamydia psittaci is transmissible from birds to humans. If anyone exposed to an infected bird develops flu-like symptoms, that person should seek prompt medical care and inform their healthcare provider about having contact with birds. Treatment is simple and most often successful in humans, but neglect of the symptoms or delayed diagnosis may result in serious illness, even death, especially in compromised persons. Chlamydia psittaci is not the same organism that causes genital chlamydia infection in humans, which is due to a related organism call Chlamydia trachomatis. Clean the premises of all organic debris and then disinfect with an appropriate cleaner like F10 Veterinary Disinfectant which can be purchased from your veterinarian. Other disinfectants can include bleach and water solution (1:32 dilution or 1/2 cup bleach per 3.8litres for 5-10 minutes of contact time on the cleaned surface to be disinfected. Do not expose birds to fumes of these disinfectants. Clean daily. Do not use a vacuum or pressure water. Use caution when handling dropping and care debris, take care not to stir up dust while cleaning, keep dust and feather circulation to a minimum. To reduce risk of infection it is recommended that owners consider to wearing gloves, disposable gown, disposable mask and eye wear.